Appeared in American Baby, June 1999. I dread the old ladies, the ones hobbling through our streets with their canes. When I see them, I want to duck behind the azaleas. “What an adorable baby!” one says, spotting me, leaning in close to my stroller. Her friend, also carrying a threatening-looking cane, smiles and her gold-capped tooth shines. “How old?” they ask in unison. The first lady looks up at the noon day sun, at the nearby business people, who are dressed in suits and ties and rushing into a corner deli, then down at my khaki shorts and my toes peeking out of my Birkenstocks. I can feel the earth skidding to a stop in its drag race around the galaxy. My baby could sleep upside down on a tight wire, I think. Dutifully, though, I lower the seat back. “He’ll burn his little head,” says the first lady. I put a cap on my daughter’s head. Why bother correcting them? “That’s better,” they say smugly and hobble off. My wife never gets these remarks when she takes the baby out, although she passes the same women, who live in a nearby retirement village. While being a stay-at-home dad is hardly a radical concept, amazingly it still surprises people. Generally, unless you specify the “stay-at-home” variety, most people still assume Daddy works a nine-to-five job. To survive with mental health intact, a stay-at-home dad needs an odd combination of righteousness and humility. He needs the strength to defy convention, but the reserve to keep his mouth shut and get along with the moms at the playground. And he needs to channel the competitive passion he may have felt in a more traditional job into gentler pursuits. One day, surfing the Internet during one of my daughter’s naps, I find such a pursuit: an online support group for stay-at-home dads and then, to my surprise, a play group for dads and their kids in my neighborhood. The play group meets Friday mornings at the Children’s Museum, where four of us crowd into a tiny padded room for children under two years old. Everything is miniature, including the chairs. My wife thinks that all my competitive zeal gets fired up at these play groups. The contest starts with merely reaching my destination. Unlike another play group I know, in which moms and their kids float in and out without a rigid schedule, I pride myself on one talent: Against all infant-produced chaos—the unpredictability of naps, the finicky ups and downs of baby’s appetite, exploding diapers, missing pacifiers, and uncontrollable drool—I can make it to my play group on time. It’s my own personal version of Man against Nature, the great cosmic struggle for order and dominance. But instead of a great white whale, I battle a wriggling infant who hates to have her diaper changed. The other guys in the group have similar stories of amazing daddy feats. Much as I recognize the bravado of these stories, I’m as vulnerable to bragging as anyone else. For instance, I can put on a comedy show for a tough, pre-verbal audience who’s past ready for a nap, carry a fifteen-pounder and push a grocery cart at the same time, and sing all the lyrics to “Rubber Duckie” in alternating bass and falsetto voices. Secretly, I wish there was a Daddies’ Olympics to test who could change a fussy nine month old faster out of a tight t-shirt. I can see myself, high on an Olympic pedestal, gold medal around my neck, tears streaming down my face, as I mouth the words to the national anthem. “Why is everything a contest?” my wife asks, who refuses my fifth request to be timed when she changes a diaper. “No,” she says, kissing the baby. Even though it has some of the same fun as an indoor sport, being a stay-at-home dad has drawbacks too. I worry that I’m not gentle enough with my baby. I worry that all of the stuffed animals that line the shelf in her room—even a stuffed broccoli who laughs when squeezed, the gift of pacifist, vegetarian friends—harbor secret homicidal tendencies. In play, they all attack the baby, aggressively nuzzling under her neck, making her shriek. When I initiate the same game with a friend’s baby—a child fortunate to have a soft-spoken mom stay at home with her—she screams for her mother to rescue her. At nine months, my daughter is already desensitized to play-time violence. Even as I give in to the frivolity of these playtime activities, I worry that our other games—“Dorothy and the Flying Monkey,” “Baby Bandit on the Run,” and “Macho Texas Cannibal”—are also too aggressive. I worry that this is where false memories of abuse come from. I can hear my daughter as an adult in psychotherapy: “My father was a terrorist. I never had a moment’s peace.” I thank God the old ladies have never seen me play with her. Like “Mrs. Doubtfire” and “Mr. 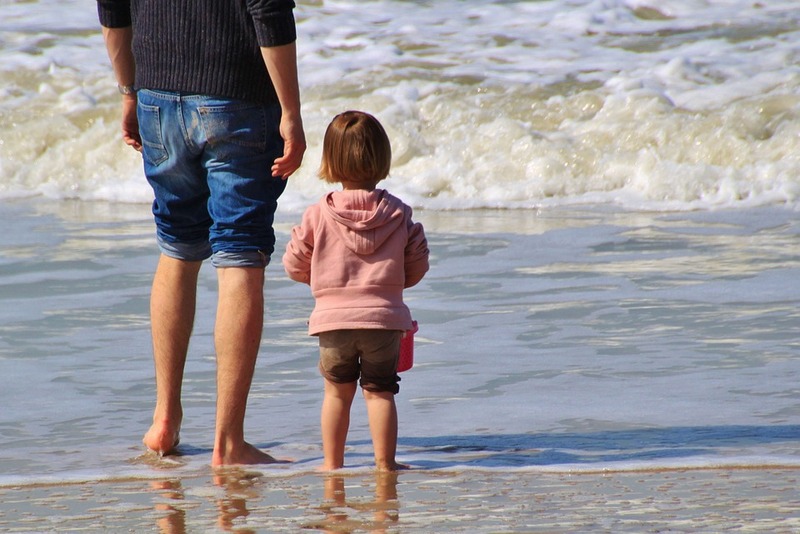 Mom,” stories about stay-at-home dads often end sentimentally with the father getting in touch with his blocked-off femininity, or realizing that his kids love him, in spite of his slapstick efforts to take care of them. I have moments like these, although there’s such a pastel Hallmark aura to them, I conceal them from most people. I also have moments when I think I should host a day time TV show about raising babies—a la Martha Stewart. Unflinchingly perfect, militaristically disciplined, I can see myself modeling grace under pressure to frazzled stay-at-home parents. The TV camera pans overhead as, smiling, I expertly siphon dribble out of baby’s nose. “Voila!” I exclaim. But there are other moments, changing diapers or watching my daughter knock over a tower of blocks for the fiftieth time, that I miss the competitive thrill of my old job. But, most often of all, I wish that my wife and I were raising our baby in Sweden, where couples get a year of parenting leave together, where marital teamwork more easily replaces parental competition, because I miss sharing with her the wonderful, full-time, funny task of raising our squirmy little kid.